From Annex 13: Design, Construction and Maintenance of UTES Wells and Boreholes. One scope of Annex 13 has been to evaluate and to further develop the equipment and procedures for Thermal Response Testing ( TRT ) as a tool for design of Underground Borehole Heat Exchangers (BHE). In a thermal response test, a constant heat injection or extraction is imposed on a test borehole. The resulting temperature response is then used to determine the thermal properties of the ground and to evaluate the thermal resistence of the borehole heat exchanger. The test is therefore very useful for design and optimisation of systems that use the underground as a source of energy or as a storage medium. 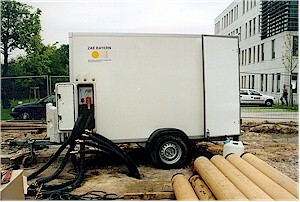 The first mobile test units were constructed in Sweden and USA in 1995 within the framework of Annex 8. The TRT has then been further developed with respect to test procedures and methods for test evaluation in Annex 13. For high temperature storage applications it has also been a part of Annex 12. Within a short period, the utilization of TRT method has become popular method for proper design of large scale plants using ground source heat pumps or borehole energy storage concepts. For the time beeing equipments are utilized in at least ten countries. The work of Annex 13 has contributed to this success by know-how transfer between countries and by working out guidelines for test procedures and evaluation methods of test data.